July 10 – India may be taking the lead over its neighbours in terms of big tournament organisation with the FIFA U-17 World Cup this October, but the Asian Football Confederation is rolling out its development programmes throughout the region with the Bangladesh Football Federation’s AFC Grassoots Football Day being reported as a resounding success. 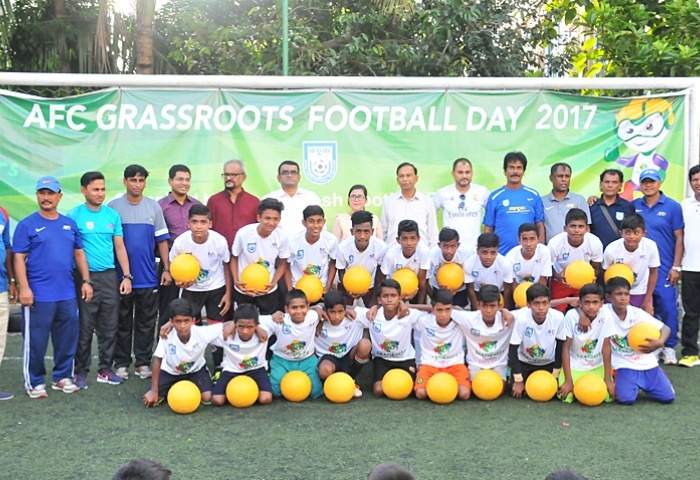 More than 100 young players took part in the day-long event at the Bangladesh Football Federation’s (BFF) artificial turf at the BFF House in Motijheel. The AFC’s newly elected female representative to the FIFA Council, Mahfuza Akhter Kiron, was present at the event that saw players in final teams of the U-12 and U-14 categories each receive a football. The AFC Grassroots Football Day 2017 has 38 Member Associations (MA) pledged to celebrate the game with some form of activity. It is part of the AFC’s commitment to ensure football remains the most popular sport in the continent. Now in its fifth successive year since 2013, there has been a year-on-year increase in participation in the event of nearly 60% from 2015 to 2017.